You will earn 922 Reward Points. Earn 1 reward point for every 1 dollar spent. Maximizes Storage Capacity: High-Density qwikTRAK can increase the storage capacity of a given area by 50%. Easy to Lay Out and Assemble: Select end, intermediate, or mobile kits and just add shelves! Units are quick and easy to assemble. Strong and Durable: Standard Metro qwikTRAK Super Erecta, Super Adjustable 2, and MetroMax Q mobile units can hold up to 2,000 Ibs. (907kg) per unit. Ideal for Rough or Choppy Floors: Floor tracks compensate for rough or choppy floors and provide a smooth, level surface to guide the mobile units in a straight line. Accessible and Ergonomic: The low profile and sloped sides of the guiding track, combined with the easy-to-move mobile units, provide safe and easy access to all stored products. Versatile: Metro shelving systems are offered in a variety of widths and lengths to fit into any size area. Dry environment: Super Erecta and Super Adjustable 2 wire shelving in Super Erecta Brite or chrome-plated finishes; galvanized solid shelving. Storage of sterile products: MetroMax Q and MetroMax i systems have smooth polymer shelf surfaces to protect stored items from ripping or tearing. MetroMax i™: corrosion proof shelving. All-polymer shelves with Type 304 stainless steel corners; polymer posts. Lifetime warranty against rust and corrosion. 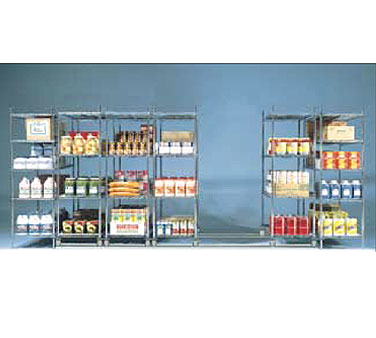 MetroMax Q: corrosion resistant, quick adjust shelving. Epoxy coated wire shelf frame with removable polymer shelf mats; epoxy coated steel posts. 15 year warranty against rust and corrosion. Interchangeable shelves and posts: Mix and match MetroMax i™ and Q shelves and posts based on the application. Corrosion proof MetroMax i™ offers a solid shelf option and better chemical resistance. Type 304 stainless steel wire or solid shelves. Metroseal 3 epoxy finish with a 12 year warranty against rust and corrosion. End plate and mounting plates (connect post with foot plate to track): Aluminum. Shelving: see spec sheets for Super Erecta (10.01), Super Adjustable 2 (10.01A), MetroMax i (9.20), and MetroMax Q (9.21). Track and joining channel: Aluminum extrusion 6063 with 1 /2" (13mm) square stainless steel tubing. Joining channel is stainless steel. Footplates and Hardware: Chrome-plated kits include plated footplates and hardware. All other systems include stainless steel footplates and hardware. Casters and Caster Horns: 31 /4" (83mm) acetyl wheel. Chrome-plated kits include casters with plated horns. All other systems include casters with stainless steel horns.